When you live in Los Angeles, no summer is complete without sipping on a refreshing, fruity cocktail poolside in Palm Springs! So when my sister (Hoku's favorite aunty) stopped by to visit us on her way to a fresh, new start in San Francisco after nine years of living in the Big Apple, an extra special girls + pup weekend getaway at The Parker was in order. What could be a more perfect summertime Southern California welcome? Driving through the gates of The Parker is like discovering a secret oasis hidden away in the middle of the desert. Curious as always, Hoku stuck his nose out of the window as he had done many times in the past when we visited the resort for brunch at Norma's. (Little did he know that this time, we were coming back as guests!) The road continued to lead us past impeccably lush landscaping until we rounded a large fountain and The Parker's iconic, sky-high, bright orange doors came into view. We had officially arrived in Wonderland. The hotel's lobby, designed by none other than interior designer Jonathan Adler, sets the tone for The Parker experience, perfectly blending whimsy and glamour. The cool details and bright pops of color is pure eye candy. We eagerly checked in with the nice ladies at the front desk and could not wait to see our room. We made ourselves right at home in one of the Parker's patio rooms, which has a spacious outdoor lounge area surrounded by vibrant, pink bougainvillea and a hammock with enough space for two. Hoku, who is not a fan of hammocks, chose to stay firmly put on the ground and found himself a comfortable spot on the soft sand. Even though it was an uncharacteristically overcast summer day for Palm Springs, temperatures had still climbed into the 100's and we wasted no time changing into our swimsuits and beelining to the Gene Autry pool to escape the dry, desert heat. (While the pool area is dog friendly - dogs are just not allowed in the pool - we decided it would be best if Hoku stayed behind to relax in the cool air conditioning of our room.) 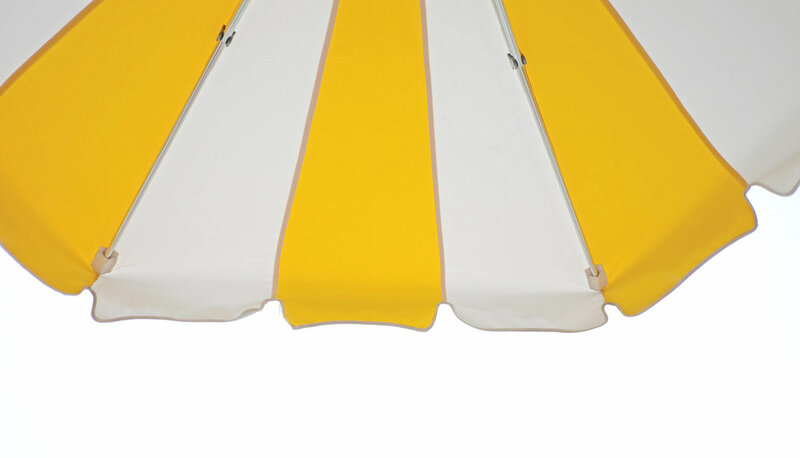 We were greeted by the friendly pool staff who quickly got us set up with fresh towels on poolside chaises under the happiest, yellow and white striped umbrellas. We alternated between taking dips in the water and sipping away at our delicious cocktails from the Lemonade Stand. For dinner, we wined and dined at Mr. Parker before taking Hoku on a starlit stroll around the property. Even in evening, The Parker's grounds are well lit and a welcoming communal fire pit surrounded by white butterfly chairs invited all to gather round. The next morning, we woke up early to explore The Parker's expansive 13-acre property and to beat the heat of the day. 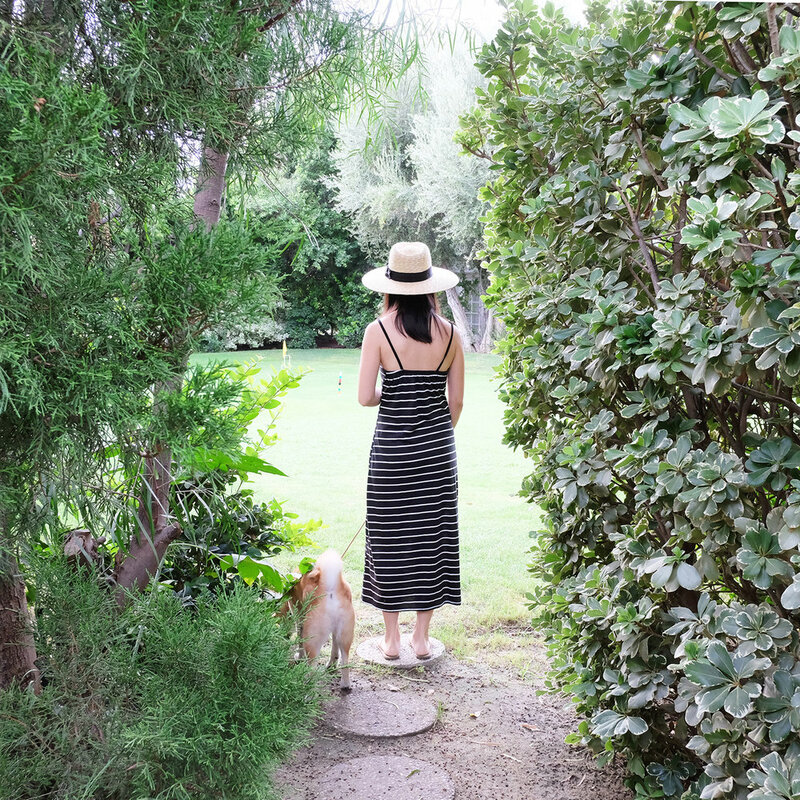 From the pétanque court to the croquet lawn, we loved discovering all the little hidden corners and beautiful vintage doorways along pathways lined with lush greenery. And of course, our visit to The Parker would not be complete without brunch on Norma's colorful, ultra pup friendly patio. The Normalita's Huevos Rancheros and Cripsy Belgian Waffle covered in Devonshire cream and fresh berries are two tried and true favorites. After a delicious brunch, we packed up our things, said goodbye to our pretty patio and passed through the great orange doors once again. We couldn't have asked for a more relaxing sister's weekend. 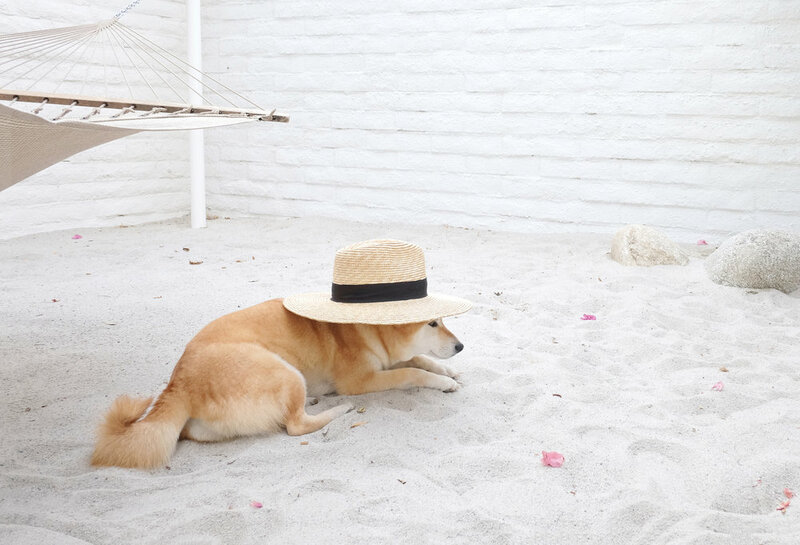 If you're looking for a dreamy, pup-friendly desert hideaway, The Parker is where it's at. 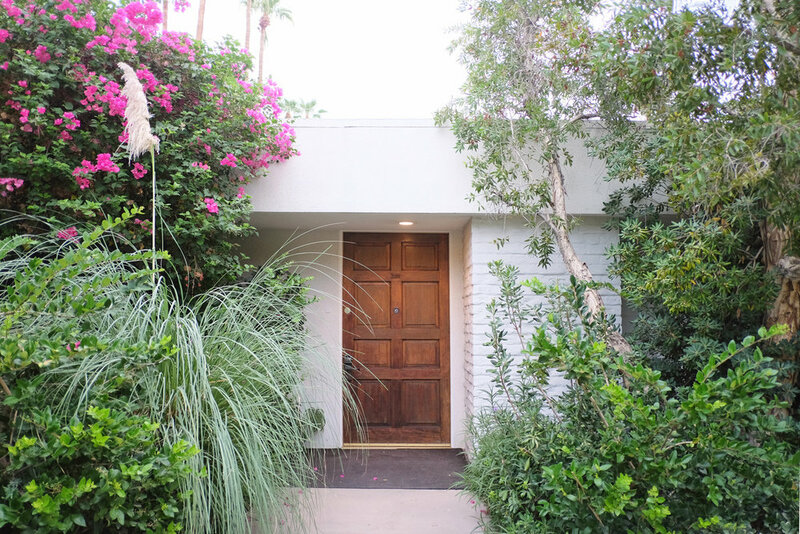 This post was created in collaboration with The Parker Palm Springs. All opinions and photos are my own. I can't believe it's nearly March and this is my first blog post of 2017. My New Year's resolution to blog more is not off to the best start, but without further ado, I wanted to kick things off with showing you another part of the house: our bedroom! During our reno phase, all this room got was a fresh coat of white paint and refinished floors. We kept the original spacious built-in closets and the little ceiling fan. True to 50's houses though, it is a fairly small room that only fits a Queen-sized bed and has no on suite bathroom, but we love that it's cozy and were pretty much already sold the first time we laid eyes on the high, vaulted ceilings. 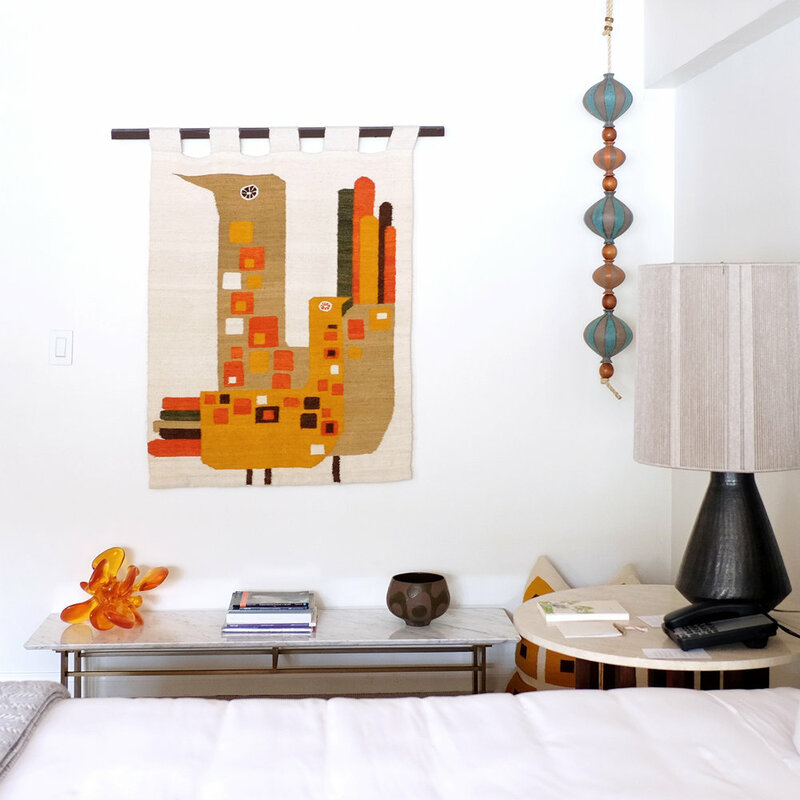 We kept things fairly minimal in here with classic essentials like white sheets from Brooklinen, a soft alpaca throw from Allku Pets for those chilly mornings, a simple gallery wall with the help of Framebridge, and of course, plants! These Brooklinen sheets are unbelievably crisp and comfy. It makes us feel like we're staying at a fancy hotel every night. Most importantly, it has Hoku's paw stamp of approval. And I mean that literally so we really need quality sheets that will stand up to frequent washes, and these have fit the bill perfectly so far. I love that Framebridge makes framing art and photos SO easy. A few years ago, I was just sitting on a pile of prints that I wanted to frame without breaking the bank. I was tired of the heavy/bulky "Ribba" frames from Ikea that were made for European print sizes and the selection on Amazon was disappointing. But now I just send them off to Framebridge, select one of their many modern frames options (my favorite is the Irvine Slim), and it comes back to me with hanging hardware attached and ready to go on the wall. So there you have it! A cozy space where two humans and a pup sleep. One day, maybe we'll have a bigger room that can fit a king-sized bed and even have an attached bathroom spa, but the idea of living simply is really growing on me. Cheers to finding that right balance of "only the essentials" and "I like nice things." 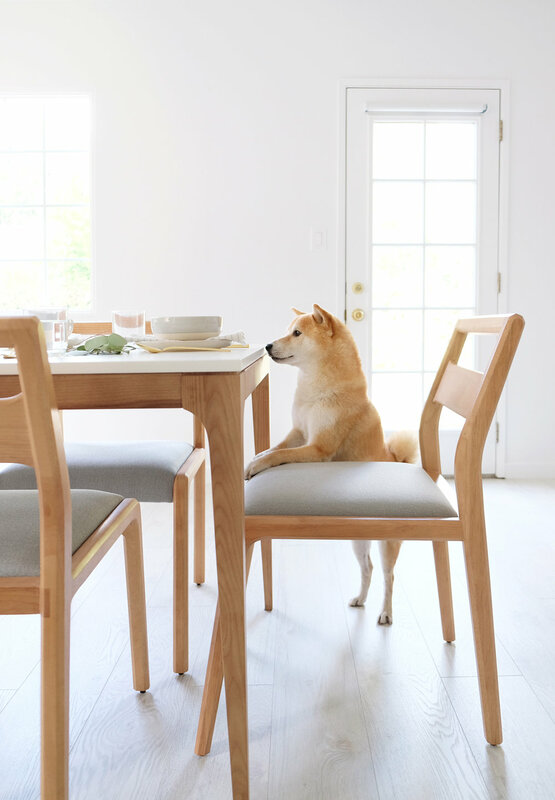 This post was created in collaboration with Framebridge, Brooklinen and Allku Pets. All opinions and photos are my own. Thanksgiving is around the corner and for the first time ever, we have an actual dining space with a real dining table and get this, matching chairs. I think this officially makes us grown ups now. Our dining table through the years have been temporary make-do pieces like a space-saving folding desk (for our 600 sq. ft. apartment) and a piece of Ikea butcher block we had attached hairpin legs to (a thrifty attempt at midcentury mod). Thanks to our friends at Rove Concepts, we've finally found the perfect dining set that will be with us for years to come. 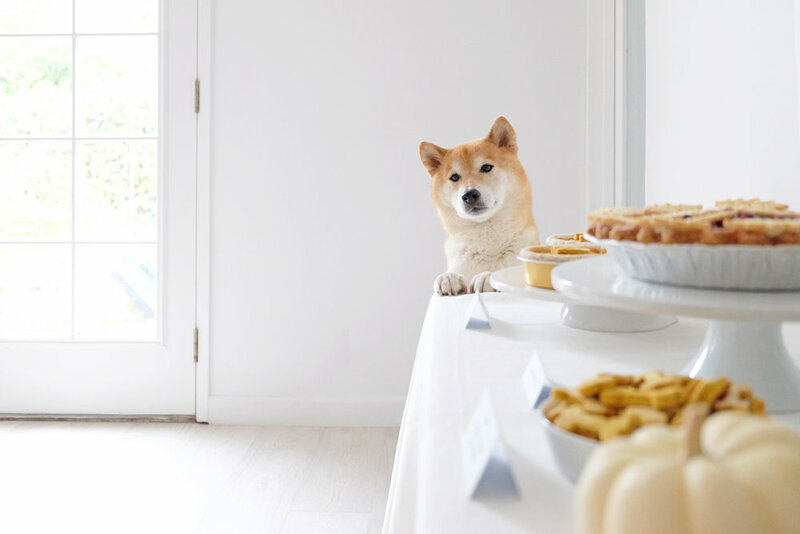 We're so excited to have partnered with them to give you a glimpse into our new dining area and show you how we plan to throw the best pup-friendly holiday dinner party ever. And when dog people get together, you know there will be merriment and good eats for humans and pups alike! A minimal table setting of soft, neutral colors with a touch of metallic is my jam. Add some tea candles for warmth, little white pumpkins, and eucalyptus branches from Trader Joes (only $3 per bunch!) and the table is set. I love the idea of breaking out of turkey tradition and roasting a chicken instead. My girl chef hero Ina Garten's perfect roast chicken recipe is indeed perfection. Simple to prep, SO delicious, and it makes the house smell amazing. Paired with roasted rainbow carrots and onions and it's the coziest meal for a cold winter's evening. I'm currently kind of obsessed with cheeseboards and its smorgasbord of deliciousness. Sit me right in front of the cheese with a glass of red wine and a pup at my feet and I'm good for the rest of the evening. The very best part of a Thanksgiving meal? Dessert of course. 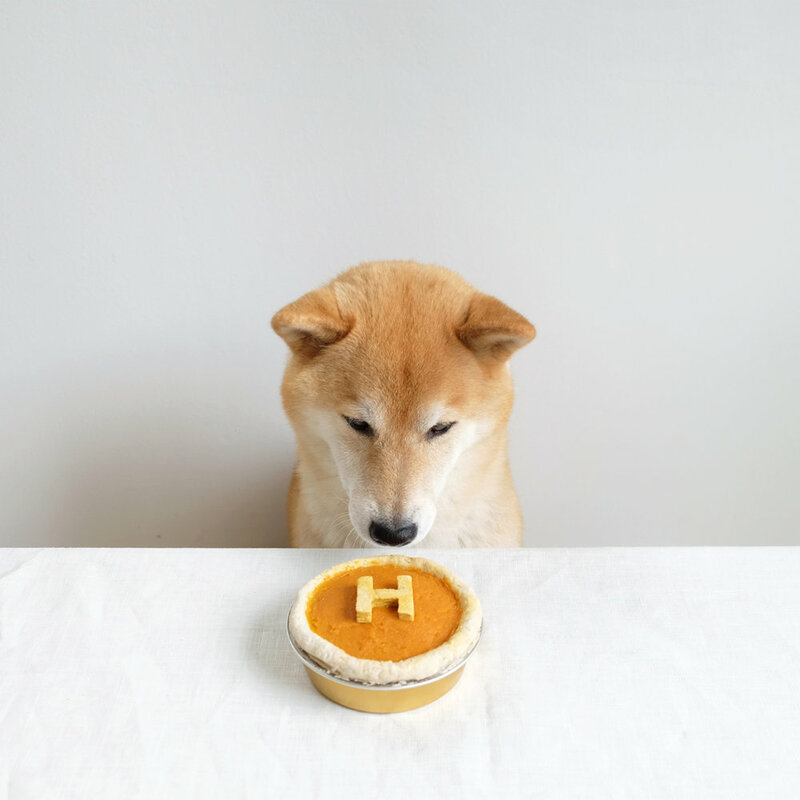 True to tradition, we whipped up homemade cookies and doggy pumpkin pies for Hoku and pup guests. I gave it a small twist this year and put their initials in cookie form on top! And for the humans, a lemon berry pie. I wish I could say I baked that beautiful masterpiece from scratch all by myself but it's actually from our favorite, local pie shop. 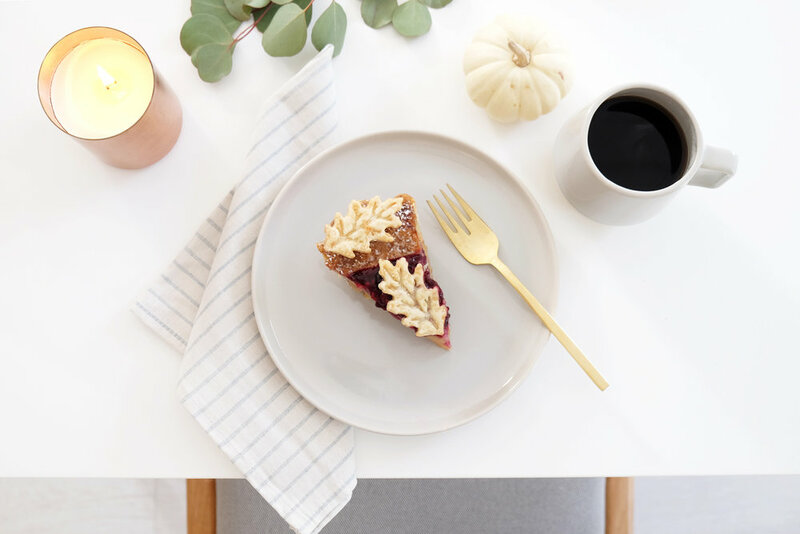 There's nothing quite like finishing a meal with a slice of warm pie and a hot cup of coffee. Hoku's favorite spot to hang out during a meal is right under the table, waiting for the occasional dropped crumb. Sometimes he'll even rest his head on our chair or legs and look up with the cutest, most hypnotizing, food-summoning puppy dog eyes and sure enough, it gets us every single time. 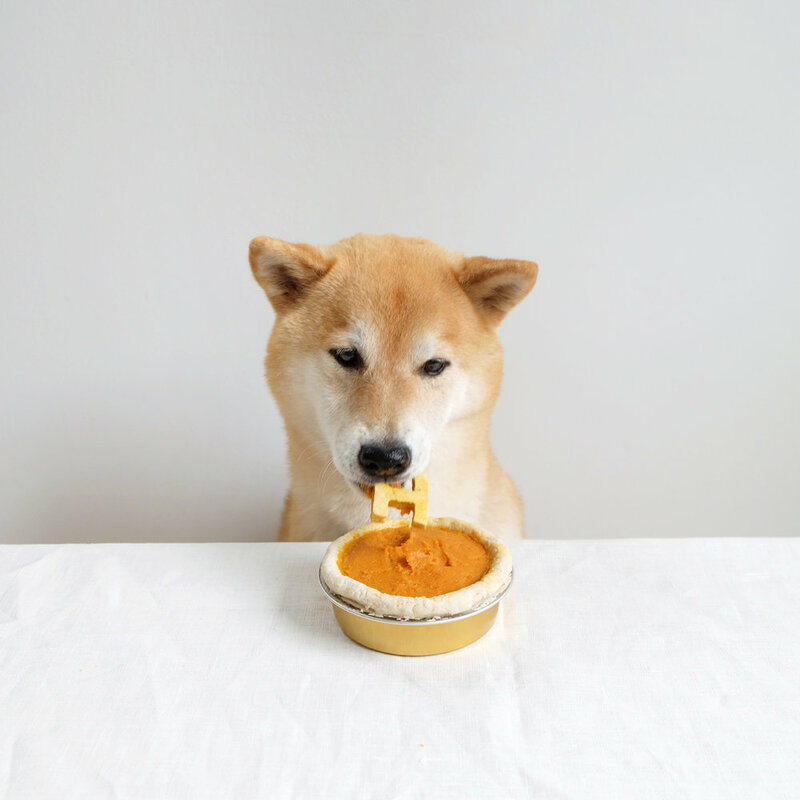 Pups get food comas too so don't forget to create a comfy safe spot for them to relax after they finish their pumpkin pies in exactly 10 seconds flat. Happy November, friends! This post was created in collaboration with Rove Concepts. All opinions and photos are my own.